There’s little doubt a scene like this is repeated multiple times a day all across America. But it’s rarely captured on film. That’s probably the reason why a photo of Charlotte-Mecklenburg Police Officer Tim Purdy talking things out with a potentially suicidal teen with autism has wracked up thousands of shares online. The incident happened in May in North Carolina. The teen had wandered away from his home in the early morning hours. Purdy knew that the teen had a history of violent behavior. “I was just thinking to myself, ‘What are you going to do? What are you going to do? How are you going to handle that?’ ” he recalled. Then, the teen sat down. And to create a connection with him, Purdy followed. They talked about school, about family and football. Pretty soon, they were both laughing. 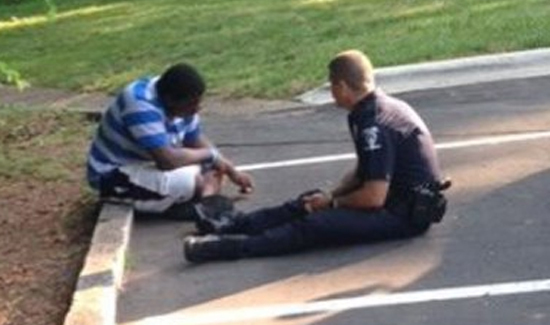 The police department posted the photo on its Facebook page in mid-May. It has been shared more than 250,000 times.